The Amico comes in an appropriately compact box. Once unpacked, it’s clear that Vapamore included everything we would need. The short attachment makes the most sense in this form factor, since it allows for one-handed operation. The Amico comes with seven brushes, a smooth surface squeegee, a detail scraper, three cotton covers, and a carrying case. Larger steamers often come with larger floor attachments, but that wouldn’t make sense on a unit this size. When you need it (or if you prefer it), a long hose attachment is also included to steam hard-to-reach spaces. As far as I could tell, all of the included attachments work with or without the hose extension. Our ideal bed bug steamer setup is the short nozzle with the smooth surface squeegee and a cotton cover. The tank is accessed and filled via a twisty cap on the top of the Amico’s body. Plug the Amico in, and a red light turns on, and the boiler gets to work. When the light turns green, you’re ready to steam. It would’ve been nice if the oversized fill cap doubled as a steam adjustment knob, but that’s just for dreamers at this price point. If you want extra features like adjustable steam pressure, continuous fill, or a solenoid controller, you’ll need to upsize to something like the Vapamore Primo or EnviroMate Brio. It takes all of about two seconds for steam to start pouring out of the Amico’s nozzle. Everything works just as well with the hose attached. It’s worth noting that the Amico is not a dry steamer. While the pressure is high enough to ensure sufficient penetration into most soft upholstery, it isn’t high enough to prevent some excess water from being left behind on the steamed surface. You’ll want to have a towel handy for a quick cleanup after you’re done steaming. All in all, we’re very happy with the Amico. While it doesn’t have as much muscle or as many features as larger or more expensive steamers, this more than fits the bill for those looking to steam on a budget (or desiring something in a smaller package). Look for the Vapamore MR-75 Amico to start shipping next week. 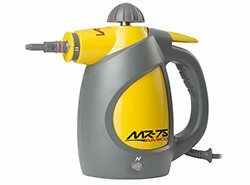 The Vapamore MR-75 Amico hand held portable steam cleaning system was designed to clean and sanitize your entire home using the power of steam.